With all the news that Google Chrome’s market share has droped since it’s release, I thought it was only fitting to add some more statistics to the fire. Through the month of September, Chrome’s usage has dropped around 30% from its release. Usage seems to have stabalised since then. 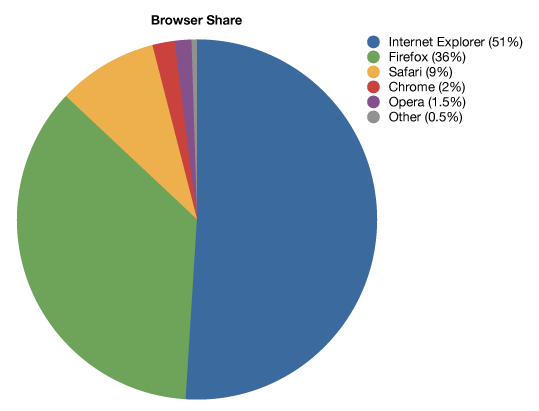 Of interesting note, is that Google Chrome has still gained a larger market share than Opera. It should also be noted that Chrome is still only available on Windows. Perhaps it’s market share will again increase when offical Mac and Linux versions are released. Perhaps Google Chrome hasn’t shaken up the market as much as everyone predicted. Did you try Google Chrome and are you still using it? I find it painful to return to Firefox or Internet Explorer after using Chrome, personally. The bottom line with Chrome is that you get a new browser with less security which takes up more memory and solves a problem which is only a significant problem with another Google product which is still in early Beta testing. Maybe when they work out all of these issues it’ll be worth a second look. Until then I’ll enjoy FF 3.5 with all its great extensions. Firefox is just IE with another name, try to install 5-6 addons on it and it will become IE. Chrome is definitely fast but still bugs are there, try using Blogger with Chrome and you will understand. The only option I am left with is to either use FF without any addon or go for Opera. I went for Opera.Its fast, has less bugs and features which are very well integrated & better than FF or Chrome.